Aldi started in Australia way back in 2001. Since then they have been able to become one of the big boys in the Australian supermarket wars! Since launching they have been able to offer an ever expanding range of products and product categories. 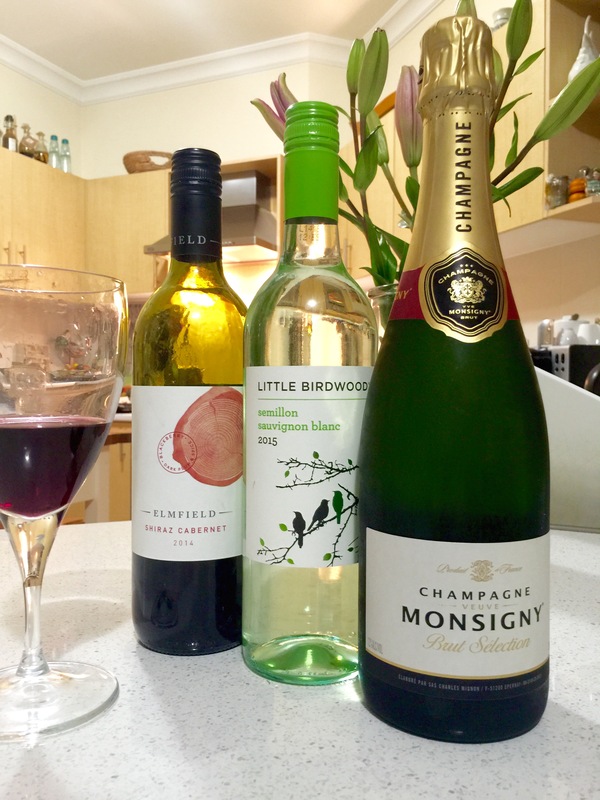 On that note, keeping in the theme of this blog I chose to review some of the Aldi selection of alcohol. I’m sure this will be one of many posts about the German discount retailer. On the menu tonight is a Shiraz Cabernet,Sem Sav Blanc and a champagne. Yes you read the right a real champagne from France! The Shiraz Cabernet: This one comes in at $3.50 a bottle sold under Elmfield and for a red wine I love it! Truthfully it took me a good few sips to adjust to the flavour. For a red wine this isn’t too heavy or bitter as some of the red wines are. Like any red wine this one does leave a furry taste on your teeth ! But for a red wine which I don’t usually like I give this bottle a 5/10 glasses on the TCC rating scale, and suggest you give it a go if you (like me) don’t usually like red wine! The Sem Sav Blanc: This bottle of Sem Sav Blanc is not so good but like many Aldi offerings comes in with great value at only $4.95 a bottle. This is sold under the “little birdwood” label. The taste was not the normal Sem Sav or even Sav Blanc taste that i am used to so this could come down to my lack of knowledge but again in this blog this is all based on my personal and sometimes uneducated opinion of wine. I give this bottle 3/10 glasses on the TCC rating scale, but again for such a low price if you don’t like no love lost. So now onto the champagne! At $24.50 a bottle it’s the most expensive of the trio but the most surprising and the most delicious! 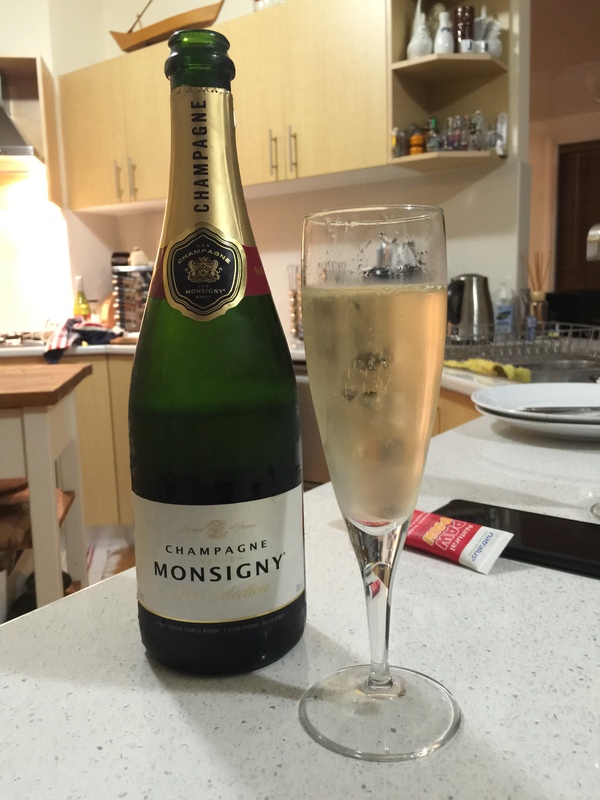 This champagne is amazing value and amazing taste. A sweet palate and flavour, goes down well without the usual bitterness that other champagne varieties present. If i had to match this to an already well known brand i would say it would most taste like Veuve Clicquot. For a rating I give this bottle a 8/10 glasses on the TTC rating scale. It’s now 12:05am on a Sunday (clearly didn’t post this at the time!) and to say the least this review is over. From an alcohol perspective Aldi has a large range with and even better price propositions. Don’t get me wrong I am not opposed to an expensive wine or vodka every now and then, but as I say I like what I like. The champagne is a clear winner here with great taste and even better value compared to some of its expensive brothers and sisters!